Lotus Notes address book to Excel converter is highly effective software to convert NSF Contacts to Excel spreadsheet. By using this tool, one can export their multiple IBM Notes Address Book into Excel in bulk. Convert Lotus Notes contacts to Excel in batch. Scan and load each contact of Lotus Notes NSF file. Generate preview of all contacts in alphabetic order. Installation of Lotus Notes is required for migration. Compatible with Lotus Notes 9.0 and all below versions. Supports Windows 8.1 and all below versions of it. In Lotus Notes all contacts are store in names.nsf file. 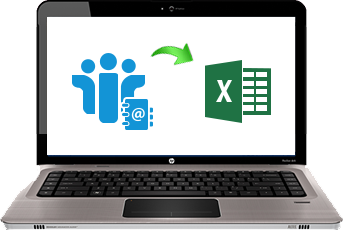 Notes to Excel converter tool allows users to convert all contacts of NSF file into Excel file without any data loss. Lotus Notes to Excel converter scans the entire file and after that, it generates an instant preview of each contact with all attributes like first name, email id, last name, address, job title, company name, etc. After complete scanning of NSF file the software load all contacts of name.nsf file in alphabetical order. Thus, users can search any particular contact easily and quickly. Also can be Preview in tool by clicking on the appropriate alphabetic list. The Software has to be installed on any windows operating system. The tool can work on all the operating system versions to export Notes Address Book to Excel information saved in xls format. “I have converted my lotus notes contacts file to Excel Spreadsheet using Lotus Notes to Excel converter software. I did not find any difficulty during the conversion process because the interface of this tool is very simple and easy to use. I am thankful to developers to develop such a simplified product to convert NSF Contacts to Excel." “Notes to Excel converter is an excellent software to migrate multiple Lotus Notes contacts to Microsoft Excel file in batch. There is no file size limitation with this tool so it can export NSF file of any size. It has many other amazing features. Thanks a lot." “Lotus Notes to Excel converter is one of the best third-party tool to migrate multiple Lotus Notes contacts to Excel file. After scanning of the complete file, it lists all contacts in alphabetical order. " Lotus Notes is a completely desktop-based email application, which stores their whole data in NSF file format. Lotus Notes contacts are store in names.nsf file. On the other hand, MS Excel is a spreadsheet, which is used to store data in the format of rows and columns. The Cost of Demo version of Notes to Excel Software is free, which allows the users to convert only 15 contacts from Notes contacts Names.NSF to MS Excel .XLS. But, it surely provides a fair idea to the users about the software. For converting unlimited Lotus Notes contacts to Excel purchase full version of Notes to MS Excel software at very reasonable price.